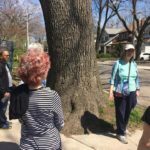 Amy Isaac, Sharon Mourer organized a very successful Davisville Village Jane’s Walk which took place on Saturday May 5, 2018. 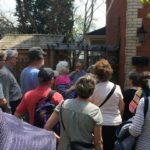 Two large groups of residents strolled through the neighbourhood and discovered some well hidden historical homes and sites in Davisville Village East.. 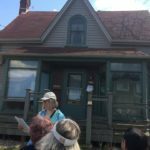 Thanks to our Jane’s Walk leaders, community volunteers and everyone who came out to learn about our neighbourhood. 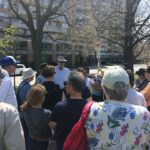 In case you missed the walk, we will be doing a repeat in conjunction with the North Toronto Historical Society on Sunday, September 30th, 2018. We will confirm the details in September. Below are some pictures from the walk. Click on the image to scroll through to the next picture. A 200-year old oak tree on Balliol St. near Mount Pleasant Rd. This heritage home was built in the 1890s.